Served with guacamole and jalapenos. 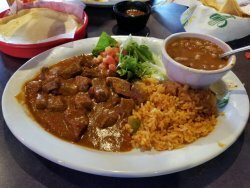 Diced beef or chicken fajita served with all the fixings. Bean and cheese with our picadillo meat and guacamole. Grilled tortilla stuffed with sauteed onions, monterey and cheddar cheese, tomatoes, red peppers and guacamole. Monterey jack cheese melted with chorizo. Served with flour tortillas. 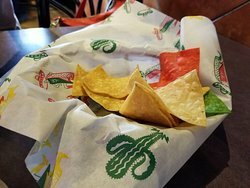 House‎ made chips piled high on a large platter with picadillo, queso, beans, cheddar cheese, sour cream, guacamole and sliced jalapenos. (2) handmade picadillo empanadas served with queso and guacamole. Homemade queso, our salsa family recipe. 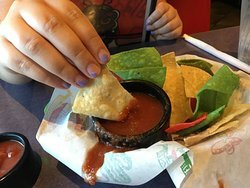 (4) bean and cheese nachos, (4) fajita nachos, flautas, cheese quesadillas, (1) empanadas, with sour cream and guacamole. 10 oz bowl of our homemade tortilla soup with small side salad. 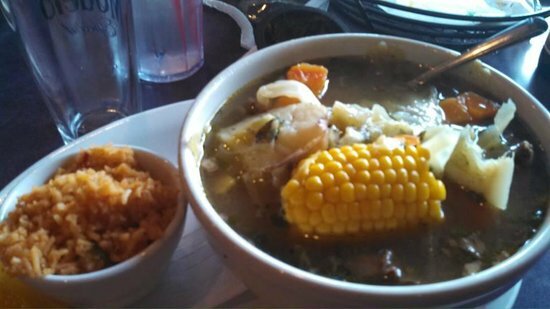 10 oz bowl of our homemade tortilla soup with your choice of beef or chicken fajita taco. Beef or chicken fajita on top of fresh chopped salad, cheddar and monterey jack cheese, red peppers, dried cranberries, cucumbers, tomatoes, avocado with your choice of dressing. Fresh chopped salad with cucumbers, dried cranberries, candied nuts, red peppers, cheddar cheese and tomatoes with your choice of dressing. Sauteed chicken or picadillo meat, in a fried tortilla shell, monterey and cheddar cheese, sour cream, guacamole and fresh chopped salad with your choice of dressing. 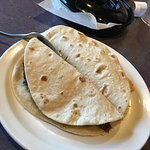 Charbroiled certified angus beef skirt or marinated chicken breast served on a hot skillet with grilled onions, rice, charro beans, guacamole, fresh salsa and flour tortillas. 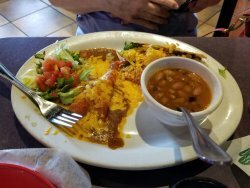 8 oz butterflied marinated chicken breast topped with ranchero sauce and monterey jack cheese served with rice and charro beans. Charbroiled certified angus beef with grilled onions, charro beans, rice, guacamole and fresh salsa. 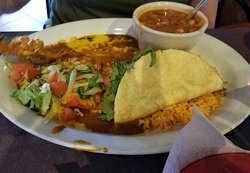 Chicken fajita served with grilled onions, charro beans, rice and guacamole. 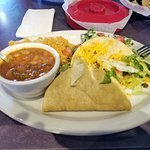 3 tacos served on corn tortillas topped with diced onions and fresh cilantro served with charro beans, chile toreado, fresh chopped salad and our fresh salsa. Choice of cheese, beef or chicken made with our homemade enchilada sauce with rice and beans. Choice‎ of two enchiladas served with either 2oz fajita, crispy taco, puffy taco or chalupa served with rice and beans. Choice of two enchiladas covered with our homemade chili con carne served with rice and beans. 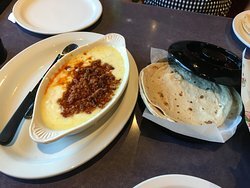 Large corn tortillas filled with monterey jack cheese and your choice of picadillo or chicken served with sour cream, guacamole, rice and beans. Your choice of one enchilada, crispy taco, rice and beans. 6 oz fajitas with grilled onions served with your choice of one enchilada, rice, charro beans and guacamole. 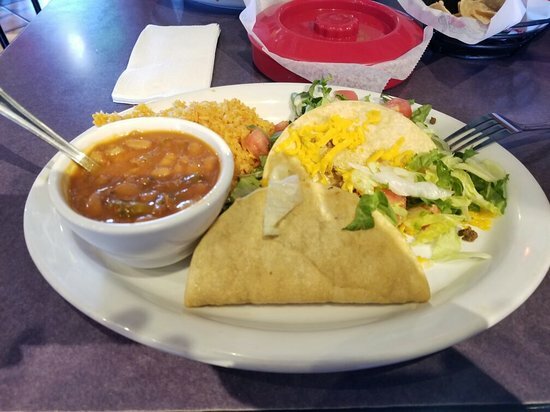 Your choice of beef or chicken crispy tacos, topped with fresh lettuce, tomatoes and cheddar cheese served with rice and beans. Mia’s house specialty, made the way our abuelitas used to make it. 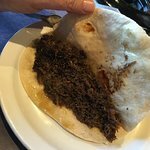 Two homemade puffy tacos with your choice of picadillo or chicken served with rice and beans. Fresh‎ fish of the day lightly breaded on corn tortillas with fresh cabbage, mia’s chipotle cream sauce, fresh cilantro served with charro beans, chile toreado and chopped salad. 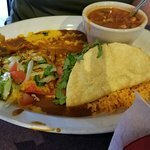 Gulf‎ shrimp grilled with blackened seasonings on corn tortillas with fresh cabbage, mia’s chipotle cream sauce, fresh cilantro served with charro beans, chile toreado and chopped salad. Two eggs topped with ranchero sauce served with beans and breakfast potatoes. Two corn tortillas topped with beans, eggs, ranchero sauce and queso fresco served with only breakfast potatoes. Eggs, chips, country sausage, fresh tomatoes, onions and jalapenos scrambled together then topped with ranchero sauce served with beans and breakfast potatoes. Authentic machacado, fresh eggs, fresh tomatoes, onions, jalapeno peppers scrambled together served with beans and breakfast potatoes. Fresh eggs, jalapeno peppers, tomatoes, onions scrambled together served with beans and breakfast potatoes. Scrambled eggs, chips topped with ranchero sauce and melted cheddar cheese. 2 eggs, 2 bacon, 2 sausage patties, 2 biscuits and country gravy served with breakfast potatoes. Everything was amazing at outstanding prices!! First but not last visit. Get quick answers from Mia's Mexican Grill staff and past visitors.